We love to run trains on our modular layout! CN FP4-A’s by Lionel pull MTH passenger cars on Kyle Miller’s layout. We make great trains happen! Like this CTTA custom PGE train by MTH, lead by RS-3 #561 on Brian Beard’s layout. We love to run CP & CN passenger trains. With F3, F7 and FP4 diesels ! We love to have Thomas around ! Lionel’s O gauge Thomas is a hit with young train lovers on our modular layout. 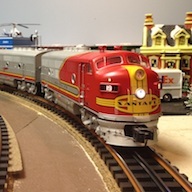 Like this 2001 Lionel Rio Grande Challenger on Gary Zabenskie’s layout! We love clockwork and tinplate! Like this 1933 Marx windup steam engine and tinplate passenger coaches on John Constible’s layout. Like this photo mural backdrop of Earl’s farm, with Lionel Postwar WP F3s running. The next CTTA Club Meeting is Sunday, April 28, 2019. See calendar for full details of ALL events. Join us for a club meeting if you’re close by, or become a member wherever you are. Annual dues are $20. 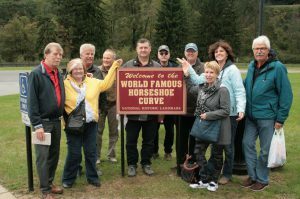 Discover more about our club of model railroaders, toy train collectors and operators, the things we do as friends and how we have fun with our trains! 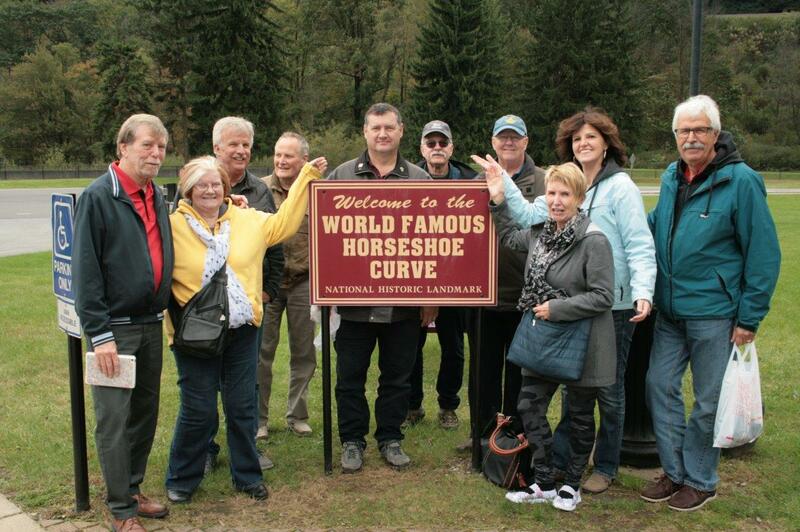 This happy group takes a break from shopping for trains at the TCA 2018 York meet to enjoy the Horseshoe Curve National Historic Site in Altoona, PA.
A variety of resources for model railroading in O gauge and any other scale. Podcasts, a directory of over 17,000 rail related Web sites, the O Gauge railroading forum community, more. 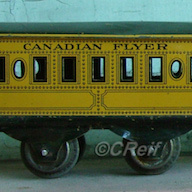 Toy Trains of Yesteryear – The Trains of Lionel’s Standard Gauge Era. Thanks again to member Martin Howbold for this wonderful Carstens Publication from 1964, detailing the history and offerings of Lionel Standard Gauge in the early 1900’s. World record length Lionel Train. This excerpt from Greenberg’s Guide to Lionel Trains 1970-1991 Vol 2, describes the 13 month odyssey to set the record with a 751-car train! 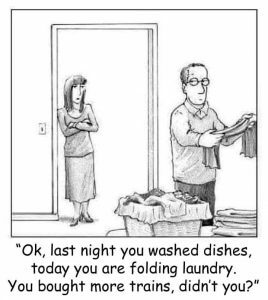 Thanks John Warlimont for this one. Coming in April: Indian Hill Heritage Railway train travels 2019. By Frank & Annie Schmidt. Coming soon: Moving Port Moody Station down the tracks. Coming soon: Double up a Lionel signal bridge for dual direction lighting. Our exclusive limited edition Club Cars are available to members and hobbyists. Check out our production history here! Not a CTTA member ? Join now. Coming soon! A very unique 2019 reefer from MTH. Our latest car is now SOLD OUT. 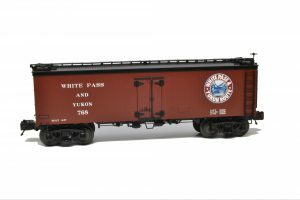 2018 MTH Premier Line White Pass & Yukon 36′ reefer. 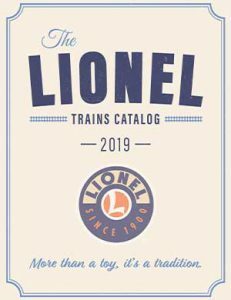 Lionel 2019 Big Book catalog! This is the biggest Lionel Catalog ever! Featuring the latest and best from Lionel. Including a Canadian Pacific FA-2 passenger set, CN ore cars and CN SD70’s in S gauge. View or download previous Lionel catalogs here. 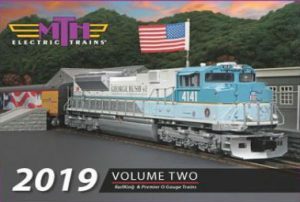 New MTH 2019 Volume 2 Catalog! Check out MTH’s latest, including a Ontario Northland SD-40-2 and Canadian Pacific Holiday train. View or download previous MTH catalogs here. 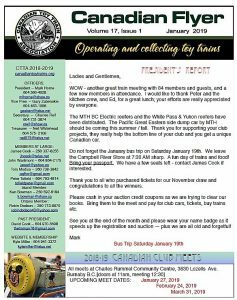 The Canadian Toy Train Association meets on the last Sunday of the month 9 times a year, every month except Summer vacation July & August, Winter vacation in December. Meets take place in Burnaby, BC. Doors open at 11:00 am, lunch is served at noon. Business meeting starts at 12:30, and auction starts at 1:00 pm. NEW – Here’s the April 2019 issue! Sante Fe Railroad fun in O scale – Colorado O scale modelers. Take a ride on some fine diesel powered passenger trains led by classic warbonnet livery. Check out more of our member’s videos and lots more toy train fun on our Videos page and YouTube channel! Each fall and spring, manufacturers discuss their latest innovations at a special Open House held at the National Toy Train Museum the Wednesday before the York meet. In addition, other presentations of interest are featured. These are from the Spring 2019 event. Jan 19, 2019 - Bus trip to Great Train Show, Puyallup, WA. In case you missed it ! 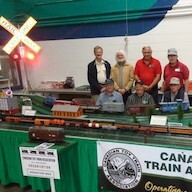 CTTA Members enjoyed their annual bus trip to the Great Train Show in Puyallup, WA. Check out pictures and videos of the action here! Dec 13, 2018 - Major blow to Bombardier - Lego wins VIA bid! In the latest setback for Canadian manufacturer Bombardier “You’ll Get It When You Get It” Incorporated, Via Rail has awarded the $989-million contract to modernize their aging rolling stock to: Lego. A popular Alaska tourism train has made its way down to Bellingham for some rest and rehabilitation this winter. Sept 12, 2018 - Lionel Corporation Tinplate deal with MTH to expire in 2019. 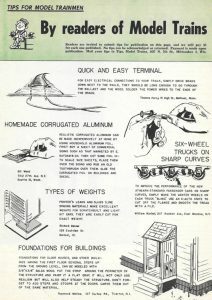 The latest and final Lionel Corporation Tinplate catalog has been released as an online interactive flipbook on the M.T.H. website. Faulty equipment and a host of mechanical errors caused the 2017 logging train derailment in Woss that killed three people and injured two, WorkSafeBC has found. June 23, 2018 - Honey, I bought a railway! Learn how the Friends of the Battle River Railway are pulling out all the stops and keeping a train excursion on track in central Alberta. CN Rail announced a 340 million dollar investment in the province today. Some of that money will be spent in the North to improve existing rails between Prince Rupert and Jasper and construct new ones. Amtrak has issued a request for proposals seeking to rebuild its current diesel fleet or purchase a minimum of 50 to 75 next-generation locomotives. As technology advances, transport gets ever faster, and trains are no exception. But with great speed come great drawbacks. 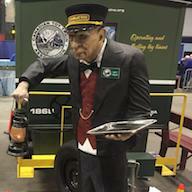 Wakefield train plan gets thumbs up from man who kept locomotive running. 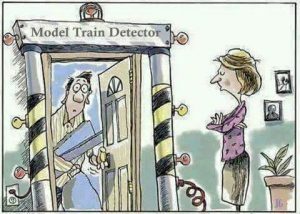 Federal budget approves new fleet of trains for Via Rail, but dedicated tracks still under study. CN announced on Dec 21st it will acquire 200 new locomotives over the next three years from GE Transportation to accommodate future growth opportunities and drive operational efficiency across its system. Sept 9, 2017 - BCR 1304 Connaught car launched in Cloverdale! The 106-year-old car is back on the tracks after thousands of hours of refurbishment. BCER 1304 is finally back to work after years of restoration by the Fraser Valley Heritage Rail Society (FVHR). Built in 1911, 1304 was a B.C. Electric Rail car that took passengers from Vancouver to Chilliwack, stopping along the way in Cloverdale, Langley and Abbotsford. Fred Webb retired this week after a lifetime connected to the Royal Canadian Navy. He joined up in 1959, retiring as a master seaman in 1981 -- only to take a civilian job as a deckhand with the Queen’s Harbour Master days later. HAMILTON, ON – Today, K+S Potash Canada (KSPC) is pleased to accept their first domestic rail cars built by National Steel Car (NSC) in Hamilton, Ontario, the same manufacturer that produced the company’s international fleet last fall. See the view from the driver cabin of China’s super-fast trains, and take a tour of the control rooms running this massive operation. After surveying the dozen railcars and cargo of Lincoln Logs strewn haphazardly across the grass mat, investigators concluded Friday that a massive model train derailment was the result of conductor fatigue. Kyle just checked out this fascinating collection of Canadian Pacific artifacts collected by Wallace Chung over 60 years. You should too! It's free and its at UBC.